Rich elm and beech double ladderback church chapel chairs with shelves from Saint Jude-on-the-Hill, Hampstead. 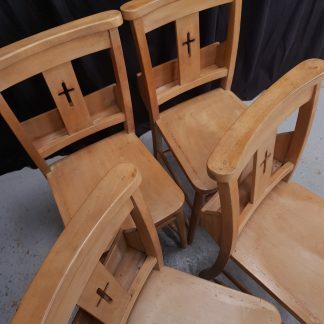 These are among the best old church chapel chairs we have for sale. Lovely rich colour and deep patina, large dimple plugs on top of a classic kidney shaped top rail. Shaped elm seat and full ‘Top Hat’ superstructure underneath, suitable for storing a hassock/kneeling cushion, or a large gentleman’s hat. Shelf at rear for hymnbook.